Tunisia Demos: "The people want Bin Salman to be judged", "No to the killer of Yemeni children"
Tunis (AFP) – Saudi Crown Prince Mohammed bin Salman held talks in Tunisia on Tuesday as hundreds of protesters rallied against his visit, urging justice over the murder of journalist Jamal Khashoggi and condemning the Yemen war. AFP / Fethi Belaid. 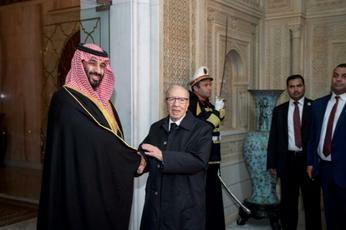 Tunisian President Beji Caid Essebsi shakes hands with Saudi Arabia’s Crown Prince Mohammed bin Salman (L) upon the latter’s arrival at the presidential palace in Carthage on the eastern outskirts of the capital Tunis on November 27, 2018. Featured Photo: AFP / FETHI BELAID. 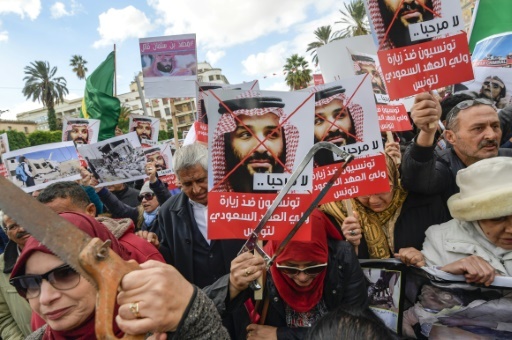 Tunisian protesters hold up saws and pictures of Saudi Crown Prince Mohammed bin Salman with the slogan “Not welcome” on November 27, 2018 in Tunis.